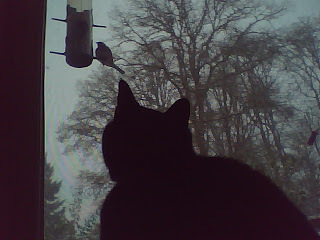 This is my cat, September....looking longingly at the birds that adorned our feeders all day long. She kept vigil from around 7am until 4pm. I spent my first night alone - completely alone, in I think, forever. I honestly cannot rememer any time where I didn't have either Jim or the kids at home with me. My parents did their Christmastime Nana & Papa stayover last night. They had all four of our kids, as well as all four of my brothers kids stay the night and they baked cookies, and hung out. To make the stayover even more fun, it snowed today and they got to play in the snow after homemade pancakes and come inside afterwards to hot cocoa. Our youngest little guy, little Gabriel, at just 2 1/2 decided on staying over as well. He was very content with the prospect, and so Jim and I left and headed out to finish up some xmas shopping, and wrapping of secret presents before Jim headed to bed to sleep for two hours before heading into work at 1am to beat the snow. I slept in a house by myself, and woke up once during the night to the sounds of crunchy paper noises. I woke up fairly quickly once I remembered that NO ONE was in the house but me. Then I found our cat Phoebe curled up happily on the freshly wrapped gifts under the tree. She smiled (I swear she does this) and MEOWED loudly as she does to tell me how happy she was that I placed such nice little beds for her to rest on, by her new favorite water bowl (we also call this water bowl the tree stand). I headed back to bed, to wake up around 5am which is normal Gabe wake-up-time for a drink or to nurse, checked for the snow that should've been there, found none, and went back to sleep. 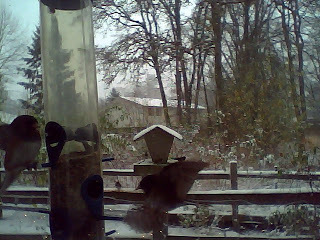 Then I woke up again around 7:30am to find that it was beginning to snow, and here is our other feeder, which was pleasing the finches immensely. I checked the computer, made myself some coffee, and picked up that darn knitted puppy that I've been putting off knitting all week - since my Baudelaires have been consuming my knitting time this past week. Which btw, I'm at the ankle on my first sock and it's coming along nicely. So, I had my coffee, turned on the celtic radio, and would have finished that pesky little pink and purple puppy if I hadn't run out of the purple Mission Falls I was using. Drat. I don't like that yarn enough to really want to buy more - but I have a few more rounds on the head, and the end of the tail too. If it was just the tail, I'd skip buying more and just knit the tail all in the pink - but...the head needs it. I don't know if the yarn stores will be open tomorrow. All the school's are closed tomorrow since it's going to be about 5 degrees tonight and they're expecting a freeze. 5 degrees sounds a tad bit better than the -1 it'll be Tuesday night. A tad. white, and the skeleton trees. 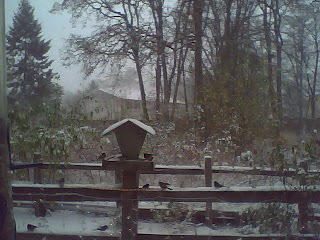 And here are the birds hovering in the air while chittering and chattering, and arguing over who gets to sit at this feeder. I feel bad that they are going so wonky over seed with the frozen ground. Jim also said the store was out of the seed I asked him to pick up yesterday. So, no one has school tomorrow - Jim's off work - and we all get to stay home and relax. Jim had to take the transit home this morning as he couldn't get his truck out of the parking lot from work and was just spinning and going nowhere. I took a slow route to my parents to pick up the kiddos and got them all home safely, and picked up Jim at the transit center and then we settled in for the afternoon. Hopefully we can pick up Jim's truck and get it back home tomorrow. 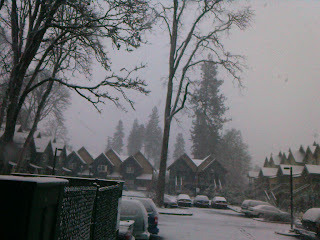 I'm really not sure what Mother Nature has in store for us...so close to the Winter Solstice. I'm very happy this is the last week of school and then Winter break starts. I'm looking forward to all those snuggly days where we don't *have* to do anything. It's all working up towards the last month before the new baby arrives. Boy, I better finish up those Baudelaires so I can focus on baby knits.